Could Library Books Sink Your Next Career Move? How would this look on your resume? Why not ask Christopher Anspach. He is the 28-year-old Iowa man in the mug shot (and today’s Resume MAG cover star!). He earned this distinction for not returning his library books on time. OK, also for not returning the library’s phone calls, and effectively becoming a thief. 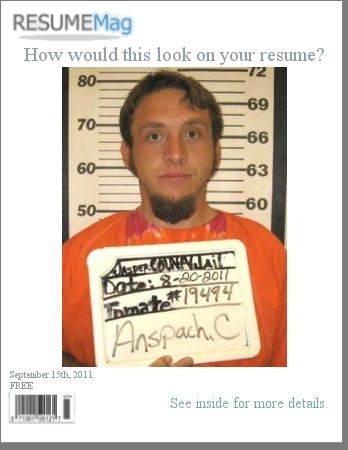 And now any potential employer researching “Christopher Anspach” online will discover that this guy has spent time in jail for theft. And that won’t endear him to potential employers. There is only so much that a professional resume writer can do to make you shine. Your pro-active resume can look great, but if the other part of your resume – the photos, articles, and embarrassing tidbits posted all over the Internet – make you look like a con artist, a puppy torturer or someone likely to pick his nose at a client meeting, don’t expect employers to be lining up to schedule interviews. And don’t think you can brush it off with an answer like “I was out of town” or “I really never got their letters”, because you can’t answer interview questions if they don’t even call you for an interview. Your mother probably told you to behave. More than once. Perhaps more than a thousand times. Hopefully you were listening. This post was featured in the Yakezie Carnival (sort of edition). Tags: interview, jail, library books, record, reputation, resume, theft.